What do I enjoy more than updating this Joy-For-Scrapbooking site? Scrapbooking itself! I want to share my recent scrapbooking pages with you and share any scrapbooking pages that you have shared with me! Find tear bear instructions that will ensure you can create your own scrapbooking embellishments that will love! 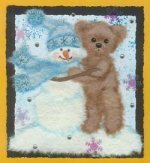 Continue reading "Tear Bear Instructions"
This is a scrapbooking site for beginners and experts. Come and read How-To's and get ideas for your albums. Also learn how you can take your hobby to the next level, by digital scrapbooking! Continue reading "Joy For Scrapbooking"
What are pictures? Why are photographs so precious to us? The simple answer to this would be that pictures are special because they freeze the moment. Continue reading "A walk down the memory lane"
Continue reading "Contribute To Joy of Scrapbooking"